H oly cow, this little blonde is exhausted today! Family wedding weekend was such a blast, and my future sis-in-law is now married to the man of her dreams! Everything was absolutely stunning and their day was so perfect! I feel very blessed to have such a wonderful "sister". I'm, honored beyond belief that she wanted me to stand by her side, and we had a blast with the entire wedding party, family and friends. But today... I need some coffee and some mingling to cheer me up, because I'm pooped! So let's kick this week off right! The more each of you passes the word along to your blog friends, the more people will stop by to visit you! Go Visit My Lovely Sponsors!! Having a cozy day inside right now, while it rains outside, would be amazing. I would watch all of season 2 of Once Upon a Time, read, and nap! I'd also ice my foot since I seem to be suffering from plantar fascitis. LOVE cozy rainy days cuddling with my dog and watching movies that my husband can't believe I've never seen: aka: lord of the rings, star wars, godfather type movies. I was deprived. 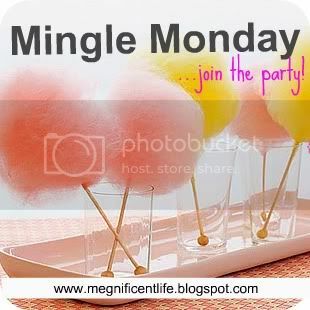 Glad to be back to Mingle Monday! 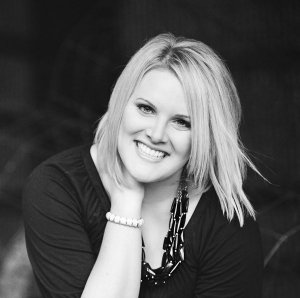 I have a new blog and looking forward to meeting some new people! Snuggled up on the couch with my kitties, my hubby, a glass of wine and Netflix! I love rainy days. I prefer to be home baking! Gosh I'd give anything for a cozy rainy nothing-to-do day but sadly San Diego is still in the high 80's this week. But! I'd love to sip coffee and tea curled up with a good book. Glad you had a good weekend!!! Cuddled up on the couch with my sweet baby girl!! My cozy, rainy days are spend in bed with my guy, our dog Emmitt, and our cat Sarabi! And of course some M&M;s and milk! I'd love to curl up in front of the fireplace (that I don't yet have!) with some cider and good movies! A nice, rainy day is always a good excuse for relaxing! It's looking a bit rainy here today. (I believe it's going to rain tongiht.) My perfect rainy cozy day would be spent in pjs watching The Real Housewives reruns. Add that with a fire roaring and that would be a great day! Rainy days are best spent with some fresh-from-the-oven baked goods and a movie! Congrats on your sisters wedding coming off so beautifully!! I would spend a dreary day in bed reading...major ♥ of mine. It's a cozy raining day in Memphis today, but I'm stuck at work. :( If I could choose though, I would be on the couch with my fur baby and heater catching up on last night's episode of Revenge! Hi! I found you through a follower of the Weekend Update blog hop! I am a new follower. I'd spend a cozy rainy day blogging, reading, watching tv, cooking, and playing with our puppies! Rainy days are a great time to stay in and bake! Following you back gladly! Thanks for the sweet comment!!! I curl up on the couch with coffee/tea. Maybe a book, maybe a laptop. Perfect day for movie watching! rainy days happen daily in the PacNW. I love getting to spend them at home with a hot beverage and usually a book or a movie and a nap for sure!!!! Whats a rainy day without a nap?